Do you believe that characteristics of a winemaker are reflected in the winery and the wines they produce? After spending a good part of the day with Alois Lageder wandering through vineyards, strolling through the village, understanding the winery and sharing many wines, I can certainly see how this is true. Alois is one of those people who I imagine makes friends wherever he goes; as we walked through the village we stopped to say hello and make introductions with everyone we encountered. As he explained how the winemaking evolved it has become apparent, curiosity is second nature to him. The combination of these personality traits are emulated in the winery that bears his name. 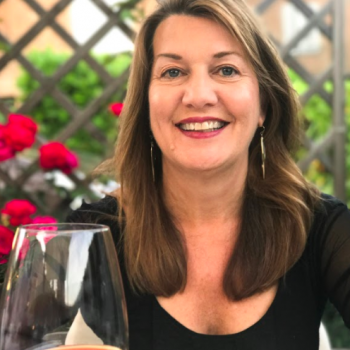 Sharing our experience will hopefully shed some light on this Alto Adige, or South Tyrol, wine estate set in one of the most beautiful locations near the Italian Dolomites. Alois Lageder is the fifth generation to assume running the family winery – inheriting vineyards dating back to 1875. 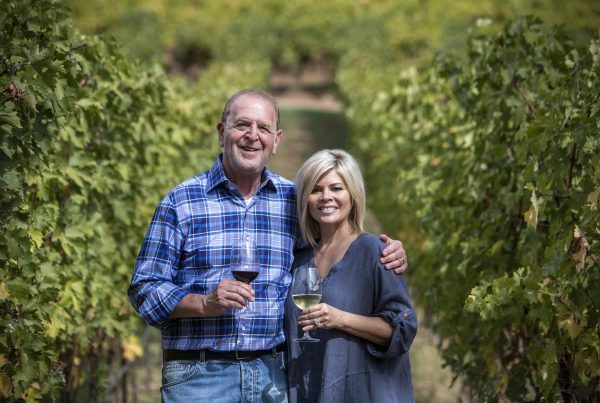 He took over this role in the mid-1970’s and since that time he’s added vineyards to the family’s estate. 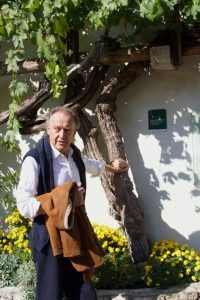 In addition, he tried to deepen and expand the tradition of cooperation between their winemaking colleagues with vineyards in the best wine growing sites of Südtirol, some of which were initiated by his father and grandfather. Through furthering these friendships, it was possible to convince them of the cultivation and philosophy of biodynamic farming. Today, more than 50% of the partner vineyards have already converted and Alois and his team have set themselves the goal of motivating the other 50% over the next few years. Today the combination of the estate acreage and their partners they encompass 370 acres (150 hectares). These vineyards are planted with 25 different grape varieties and produce a portfolio of over 40 different wines. As we walked through vineyards filled with farm animals, Alois explained to us that at one point in time they were getting inconsistent results in a vineyard which they feared may need to be re-planted. So he sought ways to improve and in 2004 began changing to all biodynamic practices. 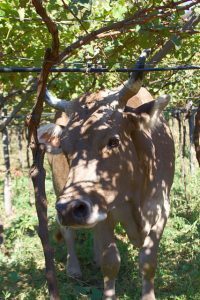 To complete the ecosystem, he teamed up with a local farmer by coming up with a scenario which benefits them both by bringing the cows and sheep down from the mountains and into the vineyards for the winter. Seeing amazing results with these practices, not only did the vineyard not have to be replanted it is now producing consistent high-quality grapes. 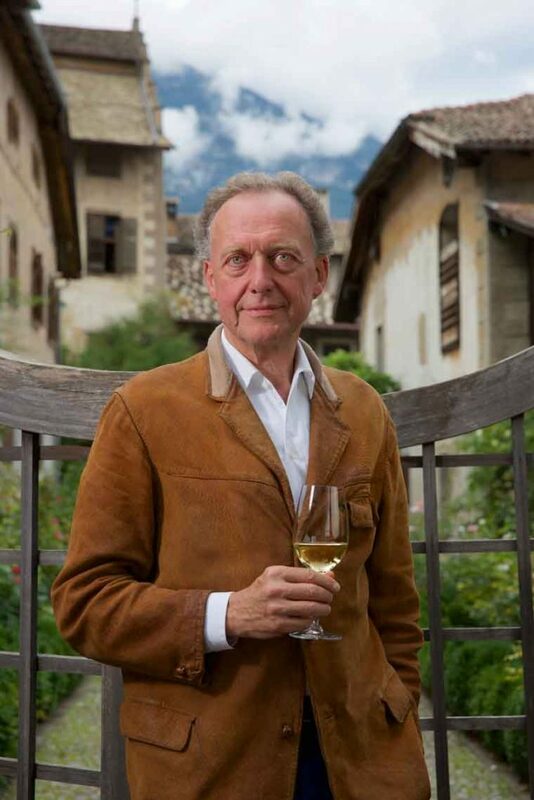 Alois feels so strongly about what they’ve experienced he is now practicing his powers of persuasion as the President of DemeterItalia, an association with the aim of promoting biodynamic products, hoping to convince other growers to follow suit. In one story he shared, he told us about when Robert Mondavi visited him in the eighties. He said he went on and on to Robert about the virtues of Pergola vine management, which is where the vines grow in an upside-down u-shape which provide a canopy of leaves to shade the grapes and protect them from the heat. This style historically had been used in this region and the Veneto for centuries. He then realized they had never tried any other way, so you can guess what came next, he was planting a new vineyard the very next year using Guyot style to experiment with how the grapes differed. 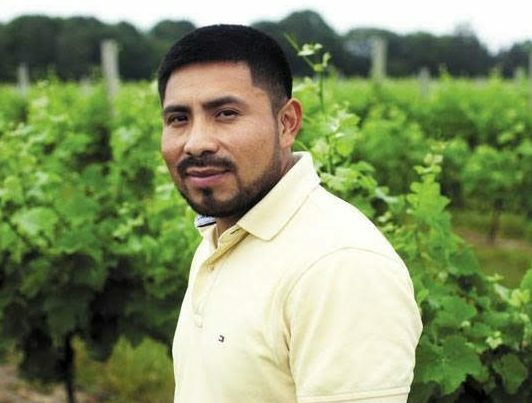 As he began to think about the impacts of climate change, he began diversifying and planting more warm weather grapes using the Guyot style. This added more international grapes and in 1986 they made their first Cabernet Sauvignon. When I asked him about the continued impacts to climate, he said you can’t continue to just plant vineyards at higher elevations but does believe that some of the cool climate grape varietals may do well reverting back to the Pergola system due to the shade this canopy provides to the grapes. 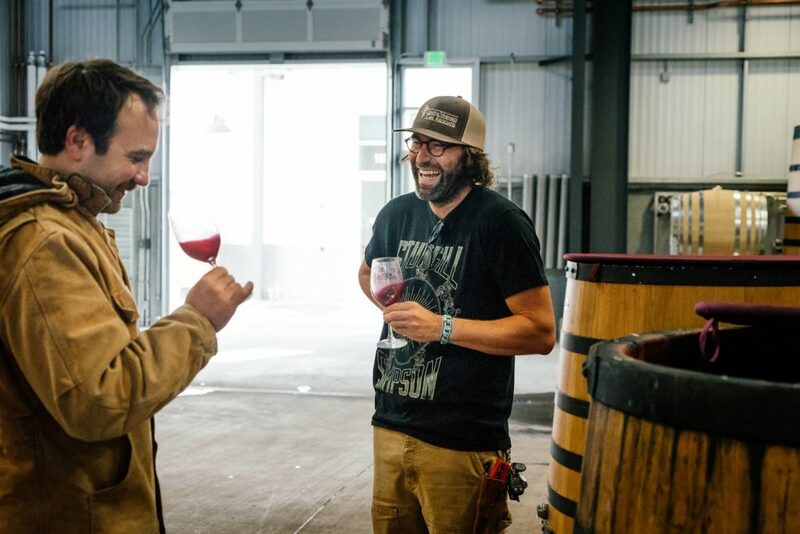 When he took on converting an old estate into their new wine making facility he wanted to continue to seek ways, which would benefit the ecosystem. He pioneered a building that is completely sustainable using all renewable energy and the structure has no synthetic materials. They also minimize the use of mechanics and use an all gravity press process during vinification. His curiosity for experimentation continues in the making of the wines. Going beyond the “standard recipe” for making whites like Pinot Grigio, Pinot Blanc and Gewürztraminer they are exploring with skin contact methods. 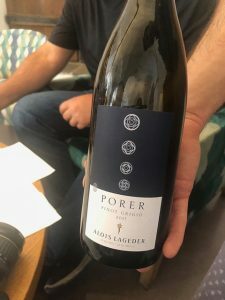 One of my favorite wines was PORER Pinot Grigio, where one wine is created by blending from three different wine components; 1) pressing the grapes immediately, 2) skin contact for 15 hours, and 3) whole grape skin contact for 8 months. In tasting these there was no bitterness, they were extremely fresh and it brought an additional complexity to the wine. The most innovative wines are a line they call, The Comets, based on the definition; “Comets flash by, leave a trail, and burn out. Some last for years, others just a few seconds. They leave an impression and can light a path to guide us in what we do every day.” Since each of the Comets is unique, the labels are done by hand using the thumbprint from everybody working in the winery to represent the tail of a comet. Everyone we met was excited to share with us which bottle his or her thumbprint had represented – such a fantastic idea! This line represents either new grape varieties, which Alois has planted 10 to 30 years ago and are not typical to grow in Alto Adige. Or classic grape varieties with different methods of vinification, different soil types and altitudes that represent the diversity of the region. Alois’ children, the sixth generation, are now all involved in the winery. Alongside his father, Clemens is running the winery. 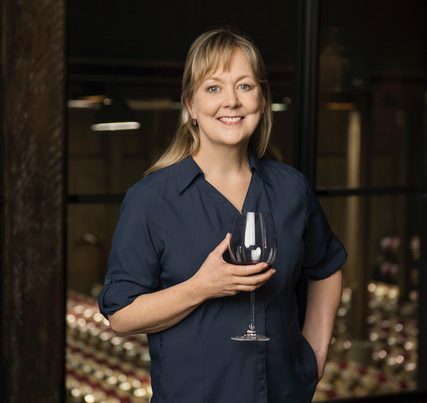 His eldest daughter Anna runs events such as the wine fair “Summa” and the youngest daughter Helena is representing the winery with their export markets. 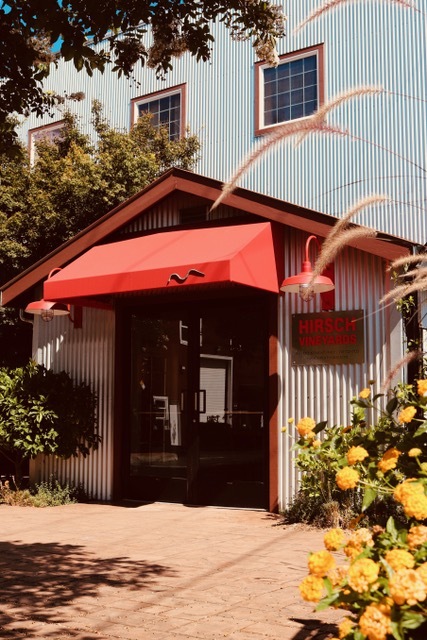 I guess this means I’ll need to return in a few years to update you on how their personalities are inspiring and influencing the direction of the winery. Until then I’ll be enjoying the wines I carried home with me and whatever else I can get my hands on here in the states, while envying those of you in Europe who can find their whole selection of wines.